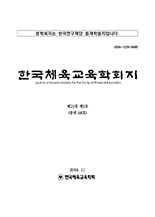 이선경,(2011).교육과정 생활주제 중심의 신체활동이 유아의 자아존중감 및 사회성 증진에 미치는 효과.한국체육교육학회지,16(1),47-58. 본 연구는 교육과정 생활주제 중심의 신체활동이 유아의 자아존중감 및 사회성에 미치는 효과를 검증하기 위해 이루어졌다. 연구대상은 서울시 2개 유치원에서 선정한 만3세에서 만5세까지의 남녀 유아 총 90명이며, 이중 H유치원에 다니는 유아 45명을 실험집단으로 C유치원에 다니는 유아45명을 통제집단으로 배정하였다. 유아의 자아존중감과 사회성 검사를 면접법을 활용하여 검사하였다. 본 연구의 결과는 다음과 같다. 첫째, 생활주제 중심의 신체활동이 유아의 자아존중감의 향상에 긍정적인 영향을 미치는 것으로 나타났다(p<.01). 둘째, 생활주제 중심의 신체활동이 유아의 사회성 증진에 긍정적인 효과를 미치는 것으로 나타났다(p<.01). 따라서 유아의 자아존중감 및 사회성 발달에 긍정적인 효과를 미치는 신체활동을 유아기에 발달수준, 흥미, 능력, 요구를 고려하여 경험하게 하는 것은 매우 교육적인 면에서 시사하는 바가 크다고 본다. 앞으로도 유아교육 현장에서 교사들이 유아의 자아존중감 및 사회성 증진에 효과적인 신체활동을 적극 활용해야 할 필요가 있으며 다양한 신체활동에 대한 계속적인 연구가 이루어져야 하겠다. The purpose of this study is to investigate how physical activity oriented living theme influences self-esteem and sociality of young children. The subjects consist of young boy and young girl around the age of 3 to 5 years chosen by two kindergarten in Seoul. From among these, 45 children in H kindergarten were assigned to experimental group and 45 children in C kindergarten were assigned to comparison group . To inspect self-esteem and sociality of young children, interview is utilized. The results of the research is as follows. First of all, the study released that physical activity oriented living theme influences improvement of children`s self-esteem(p<.01). Secondly, the study showed that physical activity oriented living theme has an positive effect on improvement of children`s sociality(p<.01). Therefore it is very suggestive in the educational aspect that young children experiencing physical activity oriented living theme can increase self-esteem and sociality. In the future, teachers in children`s education need to utilize physical activity that can increase self-esteem and sociality of young children. Also continuous study about various physical activity should be practiced.